About 6 years ago, I made a big switch. I went from bond trader on Wall Street to living on a small island in Belize. Here's my daily blog about life on Ambergris Caye...the good and the bad. 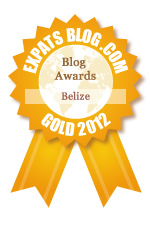 ExpatsBlog.com Expat Blog Awards 2012: Belize Gold Award! This blog won the Gold Award for best expat blog in Belize! I check Rebecca's blog almost daily to see what is happening on Ambergris Caye. I am looking forward to a visit in February and have gained much knowledge from reading about her adventures there. Keep it coming, Scoop! The "Scoop" is the first thing I read every day. The next best thing to actually being there! Hello Rebecca, I love to read your blog. If anyone wants to know whats happening on San Pedro, I always have them read your blog...Keep up the good work! Honestly, as an ExPat in Belize and even before we moved here, I find that the San Pedro Scoop has the most information about San Pedro and Belize with a very realistic view about what goes on here. Bravo....great blog! Awesome blog. Invaluable information for the newbies in San Pedro. San Pedro Scoop is the place to go to find out about places of interest, on the Island and beyond. Among the tidbits of wisdom, things as diverse as: travel tips for particular destinations in and around Belize, and where the best breakfast tacos are. The greater portion of the blog includes winning photos documenting local events, like the recent Lighted Boat Parade... Did I mention it is an awesome blog? I love, love, love this blog and read it faithfully every day!!! I love your insight to life on the island. I even got my husband hooked. After hearing me say, blah blah blah, he would ask, "where did you get that" I would answer, 'San Pedro Scoop". So after a while he started reading it also! I love this blog because it keeps me from being too homesick when I'm not in San Pedro. Best San Pedro blog, period. I send all my renters to this blog before they arrive in AC so they are well prepared !! San Pedro Scoop is AWESOME! Not only does the blog cover numerous topics, if you have a specific area of interest, Rebecca will get the scoop for you!! She is always positive, even with "bad" information to share. Very open minded and fair!! Enjoy reading the blog and greatly appreciate getting the "SCOOP" from her perspective! I read SPS most every day. Because of her posts we have decided to visit San Pedro again next year. I love, love, love the San Pedro Scoop blog...Rebecca keeps me updated on the happenings in San Pedro and makes me want to book my next trip there! This blog makes me feel like I can see the real San Pedro. I lived there for 6 years and have many friends and acquaintances. I love to read about what is happening and particularly enjoy the photos. Planning to return in a few months for a long visit! Great way to keep our guests informed about the happenings here in San Pedro and elsewhere in Belize! San Pedro Scoop is the go-to source for what is happening around town. Great writing and a fine eye for what makes the island unique. Love this blog. I read it every day, especially enjoy the photos in the winter!!! Informative and funny... Love SanPedroScoop.com! Love the stories on this blog! This blog is awesome!!! Lots of great information!! The most informative and thorough Belize blog available. Upbeat, funny, sincere, and inspiring, with great photos! Have loved every word and picture since the very first blog post.. San Pedro scoop is my favorite blog of many I follow the world over. Rebecca is a star. My go to diversion every day...even if it is to New Jersey! If you want the scoop then you should be reading the "San Pedro Scoop", thats where I go for everything San Pedro! You rock gurl!!! This blog has the best information you need to know in and around Belize, as an expat or tourist. An easy read and great photos. I read The San Pedro Scoop all the time. Like to read the blog as it keeps me up to date with the what is going on in one of my favorite vacation spots, Belize. Plus I'm very jealous of the author and wish I could do what she did and just move there! "The Scoop" is great. Check it every day both when I'm on the island and even when I'm not! Clever, witty writing and good info. Great blog about the island. Rebecca's writing style is so casual and easy, and her photos are great! Love this blog. Excellent blog! I live in San Pedro and still find it informative. Nobody gets around San Pedro like Rebecca! My favorite San Pedro blog by far! I love all the pictures. Keep up the great work; maybe I'll catch up with you when I'm down in January! Informative, insightful, witty, unpretentious, well written but unscripted, written from the heart. Love the San Pedro Scoop. I am coming to Belize for an extended stay and have been following this blog for sometime now. Very informative and a great read. Read every day while I am having my breakfast in Canada. I follow four other blogs but this is by far the best! I look forward to this blog daily. we are planning a trip to Belize and I already feel like it will be second trip instead of a first time.